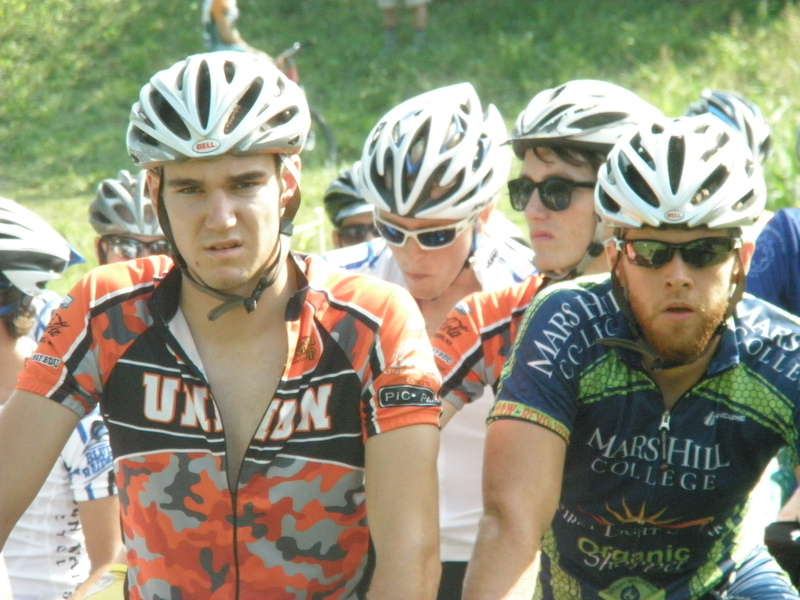 Zach Winn (Union) and Paul Webb (MHC) line up for the STXC with their game faces on. East Tennessee State University hosted the Southeastern Conference’s first mountain bike event of the school year last weekend. Schools from across the conference participated as well as a large contingent from the Midwest and Atlantic Conferences, producing a very strong and competitive field with multiple national champions present and eager to begin defense of their titles. Last year, MHC only had one mountain bike rider in Paul Webb, but this year we kicked off the mountain bike season with seven: Steven Bryan, Tim Jenkinson, Maitland Jones, Klara Rossouw, Marco Riubenov, Matt Willing, and Paul Webb. The first event of the weekend was the short track cross county (STXC) held in a large grass lot on ETSU’s campus. The course had a good hill and some technical sections including a tricky jump, off-camber tight turn, and a rock garden. The technical aspects of the STXC course would claim several victims by day’s end and be cause for at least one broken collar bone. The C men went first and MHC’s Bryan started fast and found himself in 4th position after the first climb, but on the descent he caught some air and crashed hard and then was hit hard by another rider as he stood up. Bryan bravely finished on a broken machine in 12th place. The B men had a much larger field and went a little better for MHC with Willing getting a great start and finishing a very strong 2nd; Jones finished in 7th. In the women’s A race, Klara Rossouw finished 7th. The last event of the day, the men’s A race, saw the largest field yet and started chaotically with a number of crashes in the first 100 meters. MHC’s Webb started on the front row and missed the crashes, but Jenkinson was behind and got held up. Webb went on to finish an excellent 7th, while Jenkinson finished in 28th. Later that day, MHC’s first gravity rider, Lubenov, competed in the downhill and mountain cross events, finishing 11th in both . Lubenov crashed in spectacular fashion during qualifying for the mountain cross event. See our Facebook page for a video. He’s okay. The last event of the weekend, the cross country, was held on a technical and challenging figure eight style course that included part of the STXC course and some paved sections. Suffice it to say that there was way more rock and root than pavement. Riders complained about the course’s torture of their triceps as much as it did to their legs, and nearly half the riders finished with the tell-tale signs of a crash or two. Willing again finished 2nd in the men’s B category with Jones in 8th. Rossouw again finished in 7th in the women’s A race. In the men’s A race, Webb was 14th and Jenkinson 26th. In sum, it was a great first weekend for the team. The competition was intense and the courses were demanding, but MHC is on a solid start to a successful mountain bike season. Currently Paul Webb is in 6th place overall in the A men; Klara Rossouw is in 4th in the A women; Matt Willing is in 1st place in the B men with Maitland Jones in 7th. As a team we are currently in fifth. Individual results can be found HERE. More results and points tabulations can be found at SECCC.net. The next race is at Florida State University this weekend, followed by Lees-McRae, where we’ll send a full team. As always, a big thank you to our SPONSORS.